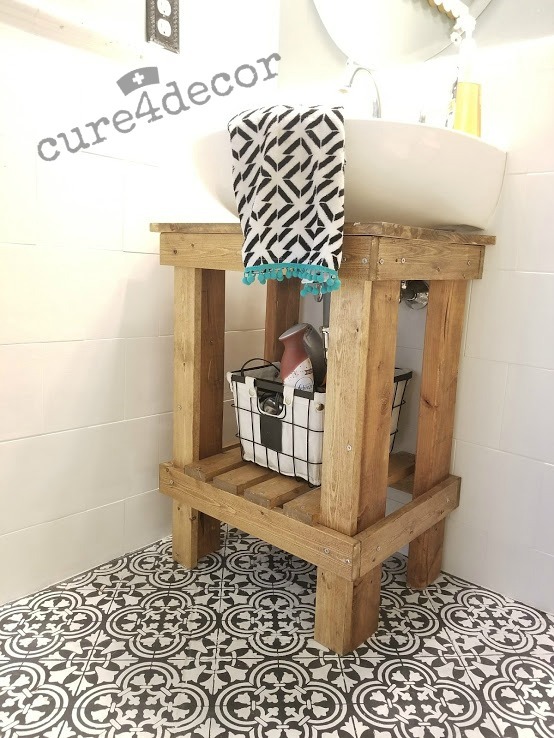 Hi There, last post I shared my inexpensive (as in almost free) powder room makeover, although the stenciled floor may be the showstopper for me, I decided to break up the bling and find a vanity that was rustic and had some character. I had no interest in taking on the removal of that sink, not now. So I went on a quest to find a pedestal sink surround that resembled a built in vanity. I searched the web for a solution to the dreaded builder grade, zero-storage sink, but I came up dry ;) So I decided to build one. Apologies for the bad photography here, there is zero light in this little P.R. !! I knew I wanted it to be a rustic style, which makes it all the easier in my book. (I'm in trouble when this distressed look goes out of style). For some inspo I perused and drooled over some amazing work from Thrifty Decor Chick, but she's just way more talented (and patient) than I am. I came up with my own plans and built it with 1 2X4 and a few 1X3's. 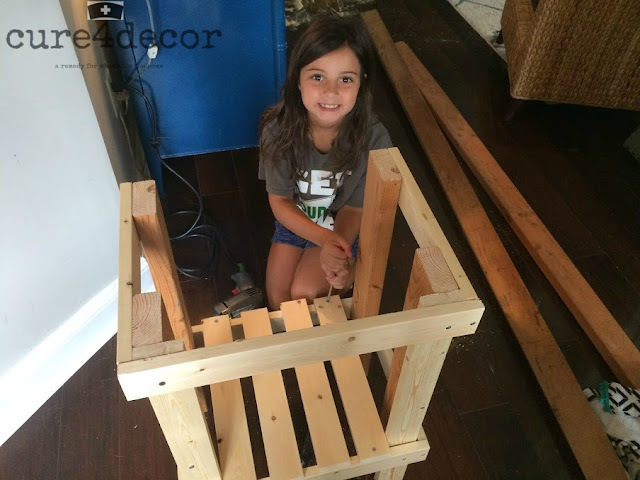 This project took my "assistant" and I about 2 hours to finish (and probably could've been completed in less than an hour if I had used power tools, but after living with a blister in the dead center of my palm, I ordered a myself a new Dewalt Power Drill). You can see I left the back open so it just slides right in. Dimension will vary based on the size of your pedestal sink, but my finished product is roughly 28" high, 16" deep, and 18" wide. I began with the 2X4's and made the vertical L's on each side. I chose the "L" to make it look a bit chunkier. I used only 1 2X4 for each of the back legs because nobody can see them. Next I wrapped the legs in 1x3's all the way around the bottom, about 6" from the floor. I then wrapped the top, foregoing the piece along the far back because I needed it to fit around the sink. Lastly, I planked the shelf along with my helper. I used leftover screws and wood for this, so it was basically free! 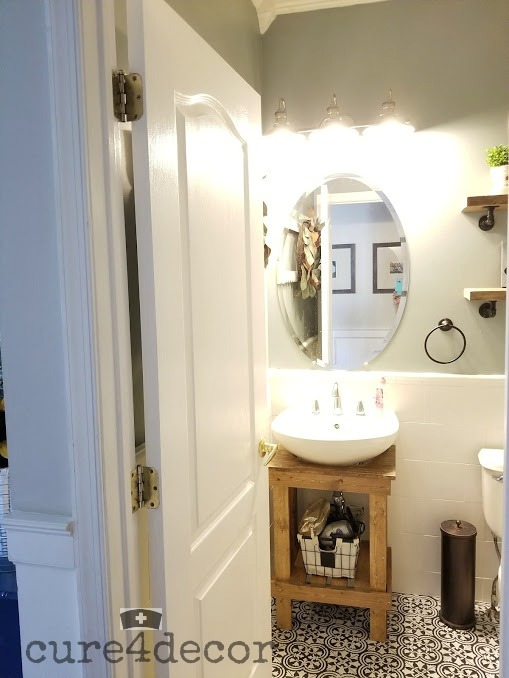 For the top of the vanity, I used a stain grade piece of wood and cut a half moon (very crappily I might add) and screwed that into the top to create the base of the sink bowl. My stain of choice is Minwax Early American. This has just the right balance of color, not too orange, not too red. After a coat of water-proof poly, it now gives us a little more storage and a fun new look for just a few bucks. What's the height, width, and depth of the vanity? It measures 28" high, 16" deep, and 18" wide. The top or "base" of the sink bowl projects 1" over the legs making it 21" wide. What's the height width and depth? Thanks anonymous, I added the info above!